So we went today, despite the rainy weather. Added benefit: it wasn’t that crowded, and there was ample parking space! 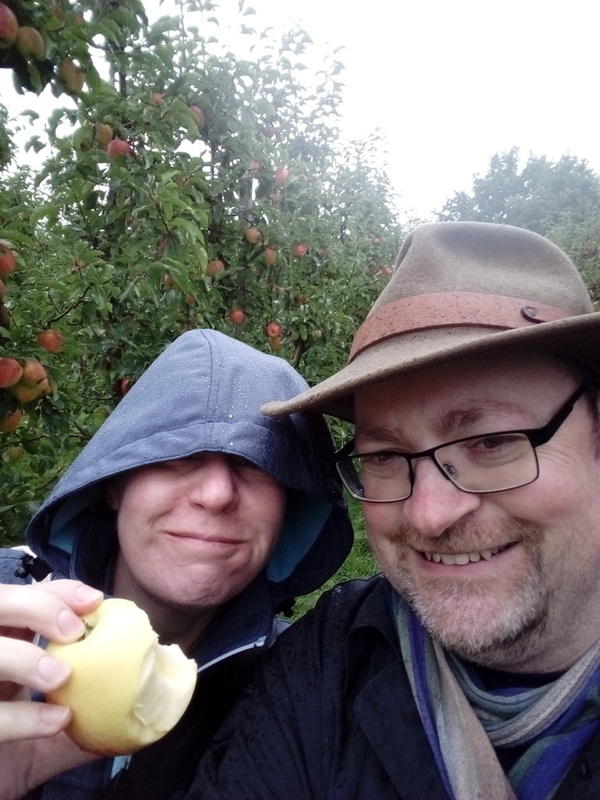 Downside: if you reach up to pick an apple from higher up the tree, the rain drips right into your coat-sleeve… But on the upside, because we’re late in the season, the delicious Pinova breed was ripe, so we got to pick some of those too! 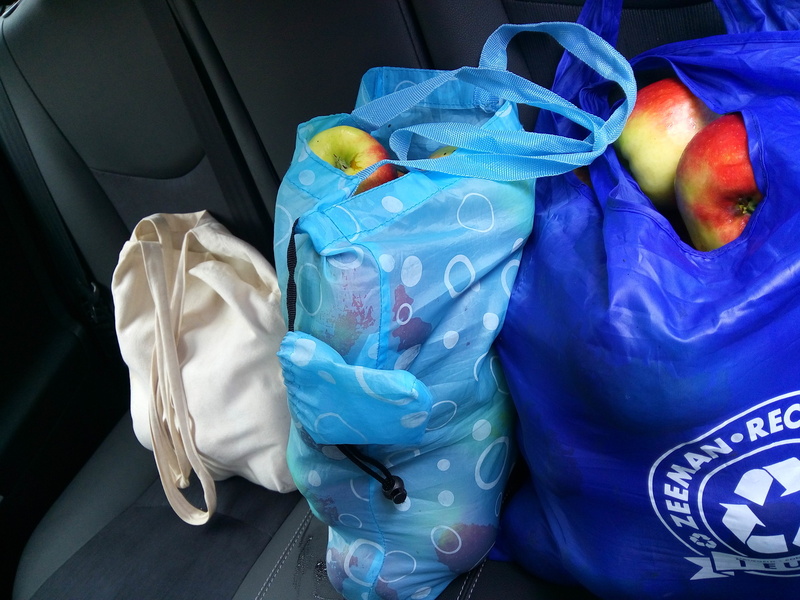 In the end, we got more than 20 kilos of apples. Some Pinova, but most of them Jonagold, for pies and apple-sauce! We also shopped in their store with lots of regional products — some really tasty stuff they have. 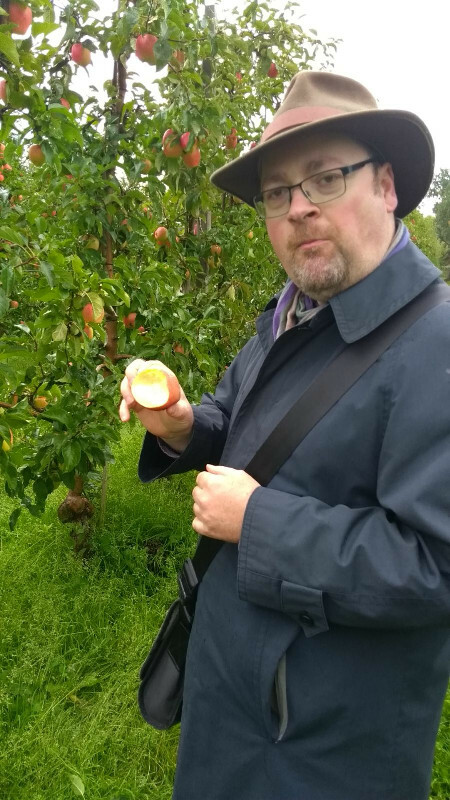 Some of the apples are really big! We made sure to select the reddest ones. 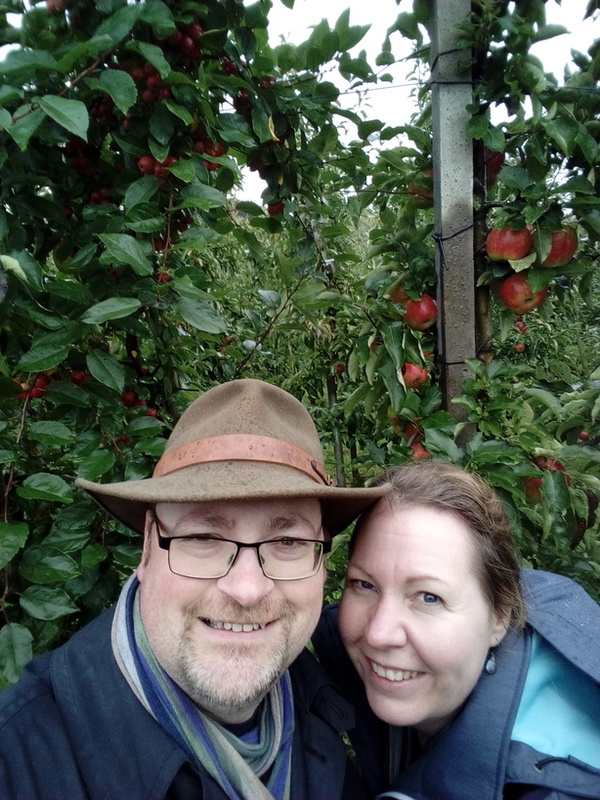 We dressed for the weather… I’m wearing my ‘rain hat’, which is quite comfy and waterproof. One of the bags we had with us. These are the Pinova, and we didn’t pick the bag completely full. On the right a Jonagold apple tree (probably a pruned oak tree with branches of Jonagold grafted on). On the left a tree with branches filled with lots of really small, red apples. These are mingled in to draw bees for pollination. This is what 20 kilos of apples looks like. Yay apple picking! I need to figure out when they'll be in peak picking condition around here; I went two years ago, but last year when we thought to do it we were too late! I love the rule that of course everything you eat while out picking is free of charge. Well, it's not a rule as such, but you can't take apples back to weigh in when they're already eaten, right? Wow, the apples look great! 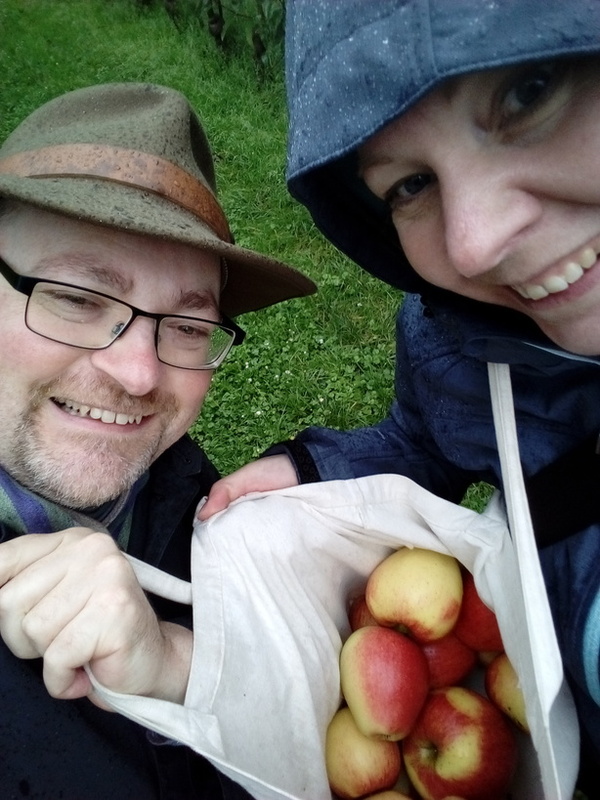 It was fun picking them, even if it was a rainy day. Will 20 Kilos of apple keep till you eat them? We've got only a few kilos of 'hand apples' (the Pinova). The rest is all Jonagold, which we will process into applesauce and pie filling. That keeps very well in the freezer. Loved the pics, and it brought back memories of picking apples in my grandmother's orchards when I was a kid. You're right, there's nothing better than apples right from the tree. Parents of friends had a vacation home in the north of France, and in the yard there were lots of prune trees, We went there one late summer/early fall to help with the harvest and jam making. We had quite the workshop going! My grandmother had lots of plum trees in her orchards too, and each early fall, she'd drum up a group of relatives (me included) and we'd pick several hundred pounds of plums and spend all day pitting them. Then they went into a huge copper cauldron that used to be used to boil laundry in the old days, along with spices and sugar, to make mulled plum jam. We'd work in shifts to keep the fire lit under the cauldron and to stir (this plum jam needed to cook for at least 24 hours, being constantly stirred). It was quite the party each year and everyone who helped got to take home some of that delicious jam. 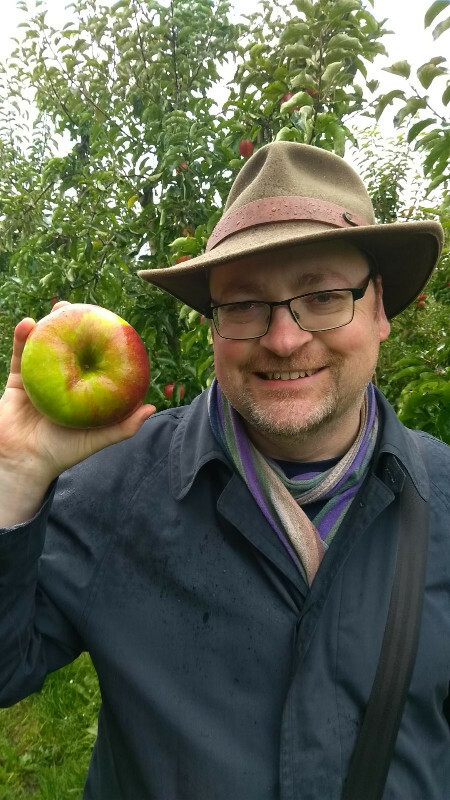 All of the orchards have been sold now after my grandmother's death, so sadly I don't have any access to her fruit trees anymore (or access, yes, since it's open land, but it's someone else's fruit now, so I can't pick it). i love apples! my fridge is full of them. only i picked them from the bin at the farmers market. it's a lot easier that way but probably not as fun. Picking from the trees doesn't really require any special skills -- anyone can do it. Just select the largest, reddest apples and turn them around until they fall off. It's not much harder than selecting the right apples from the bins. I did apple-picking as a part-time job during the brief harvest season when I was a student. There's nothing like picking your own - my mother, brother and I used to cycle to the local fruit farm - and then make jam when we got home. I did a short stint as a fruit-picker too, but it's quite different when it's for pay rather than for your own consumption!